After serving our country in the United States Marine Corps, Jeremy came onboard with National Speed to pursue his passion for high-performance. Jeremy joins the team with an extremely diverse skill set, derived from a vast experience with both domestic and import models, and an array of specialties including custom fabrication. 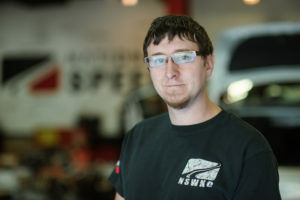 This diverse knowledge and experience is also present in his choice of personal vehicles, his daily driven modified 2012 Ford F-150 EcoBoost, and his fun car, his heavily modified 2004 Subaru WRX.